In the present, the prices of different goods, things and services are always increasing every day, and with money becoming harder to earn, it is always very important to save some money. One should always know the difference between a necessity and a luxury. Life is very unpredictable, jobs disappear, your health can be damaged and happy moments can quickly come to an end. Without savings, it is tough to live a stable life as you get older. And while you spend lots of cash for your personal “wants” such as new clothes, new gadgets, unlimited foods when you were younger, always remember that as we grow older, our parents cannot be there with us 24/7 just to make sure that our “needs” are being fulfilled anymore. This is what a netizen wanted to teach many working citizens as like her: How to spend and save their salary properly. 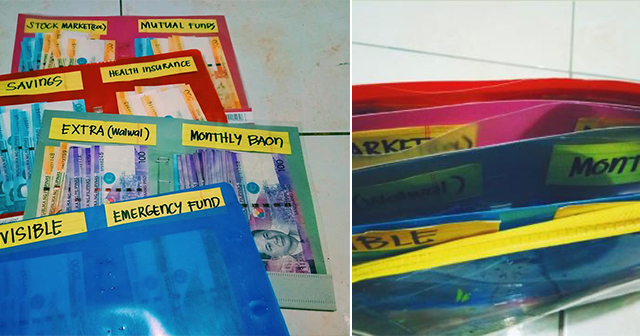 Not too long ago, a netizen named Xopau Mendoza shared her own tips and experience in dealing with life and with her finances. She shared that by making a deal with herself, she succeeded in upgrading her ways of smart distribution of her finances, so she knows exactly where her money is going. 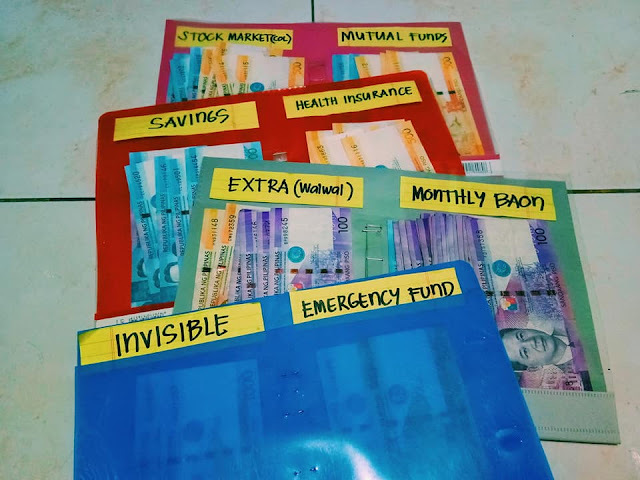 She shared that other than an excel file and mobile app that she uses for monitoring, she also learned that it is a lot easier to monitor her money with the help of a specific file folder that depends on her needs. Since she’s single with no one else to support aside herself and her family, she only has nine different kinds of expenses. Once she receives her salary, she makes sure to give her mother some funds for family expenses immediately. She then divides the remaining money into different parts: Expenses, Investment, and Savings. The frugal netizen revealed that she has two kinds of savings: normal savings and invisible savings. Hence the name, she treats the invisible savings as non-existing money that she can use for future emergencies. Since she has her daily allowance for going to work, she always makes sure that she has 100 pesos bills. Transportation, lunch and prepaid load take up all of her allowances and she always makes sure that she’s only spending P200 every day, even if it means that she cannot go out with her friends. Since life is very unpredictable, she also keeps an emergency fund for unexpected situations like an unexpected outing or trip with her friends and family or minor problems that need some money to be fixed. Because being prepared is the key to almost everything, she also makes sure that she has all of her investments for early retirement or unfortunate situations settled already. To further prepare for her future, Xopau also pays for her health and Life Insurance with a reputable company and purchased stocks and mutual funds. And last but definitely not the least, she has an “extra money” that is separated from her other needs and wants. Whatever money is left, she puts it in the extra money slot. This is the only money that she can use for herself and for anything that she wants, whether it is for drinking, going out with friends or just for treating herself by watching movies or buying books and DVDs. “Muli napakahalaga ng NEEDS VS. WANTS. Actually, wala naman talaga sa kung malaki or maliit ang sahod. Kasi higit sa lahat, ang kailangan lang ay matinding discipline, motivation at GOALS para magawa ito ng tama at mapagpatuloy” Xopau stated. Xopau’s story shared and taught us, that by saving money with the help of self-discipline, especially from a young age can help an adult slowly but surely live a stable life as time past by. Being thrifty and cautious with your money helps a lot too.